Pequot Library is nestled in the historic village of Southport, Connecticut. Located directly off I- 95, it is also easily accessible from Metro North and a short walk to the Southport Harbor. 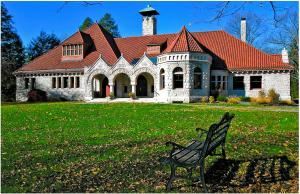 The Library’s majestic Auditorium, Reading Rooms, and Great Lawn are available for rentals for public, private, cultural, civic, and artistic events year round. Pequot Library’s Auditorium has soaring vaulted ash ceilings that provide near-perfect acoustics in addition to a Steinway grand piano and Yamaha baby grand piano making it a premier location for musical performances as well as a wonderful space for both public and private events, such as weddings, parties, meetings, corporate events, lectures, and so much more. Restored in 2006, the Reading Rooms offers a more intimate space for smaller groups. All three original fireplaces are functional and perfect for gatherings on chilly winter evenings. Pequot's Great Lawn is a beautiful open space perfect for any occasion, from a small birthday party to large events. An event in our beautiful, historic building is sure to be one your guests will not soon forget. Special Features: Pequot Library’s Auditorium has soaring vaulted ash ceilings that provide near-perfect acoustics in addition to a Steinway grand piano and Yamaha baby grand piano. All three original fireplaces in the building are functional.